"If your actinos inspire others to dream more, learn more, do more and beocme more, you are a lader." "Fighting battles is like courting girls: those who make the most pretensions and are boldest usually win." It might be hard to believe from our vantage point today, but California voted for the Republican presidential candidate in nine out of ten elections from 1952 to 1988, deviating only to help LBJ maintain office in 1964. Not even JFK lured the now liberal stronghold. New Jersey, now considered a "safe" democrat state, was once considered a swing state. Texas entered the electorate in 1948, with four electoral votes. Texas has voted democrat far more times than it has republican in its election history, even helping land Carter in the White House. It wasn't until 1980 that Texas began voting consistently red. 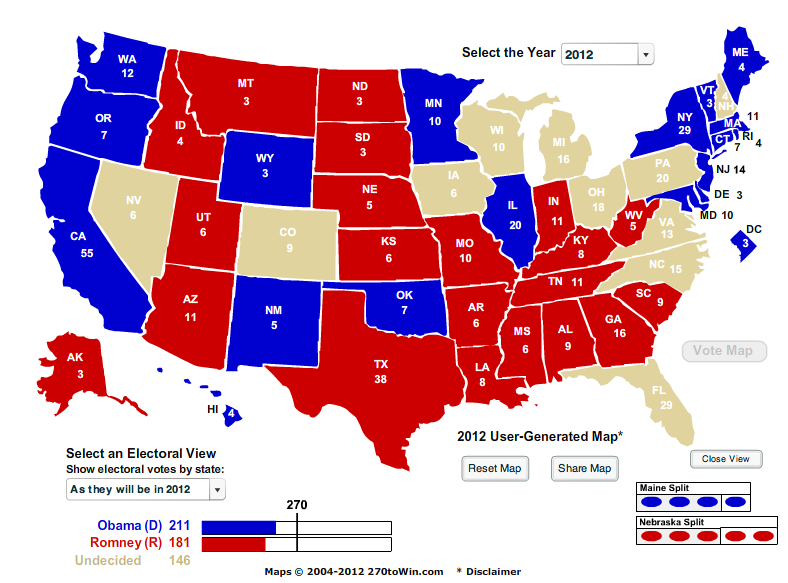 In the 1820 election, James Monroe received every electoral vote but one. A New Hampshire delegate wanted George Washington to be the only president elected unanimously. Browse this interactive election results map to learn other interesting factoids from every election since our first in 1789. There have actually only been 43 presidents. Grover Cleveland is counted twice as our 22nd and 24th president because he was elected for two nonconsecutive terms. Ronald Reagan is the only person to be elected president who had a prior marriage. James Buchanan is the only bachelor ever to be elected president. In 1837, Martin Van Buren became the first natural-born American elected President. Each of the seven preceding presidents was born a British subject. This year's presidential and vice presidential debates have had a record number of viewers. While many Americans are engaged in this election season, as it turns out, most of the world appears disinterested. 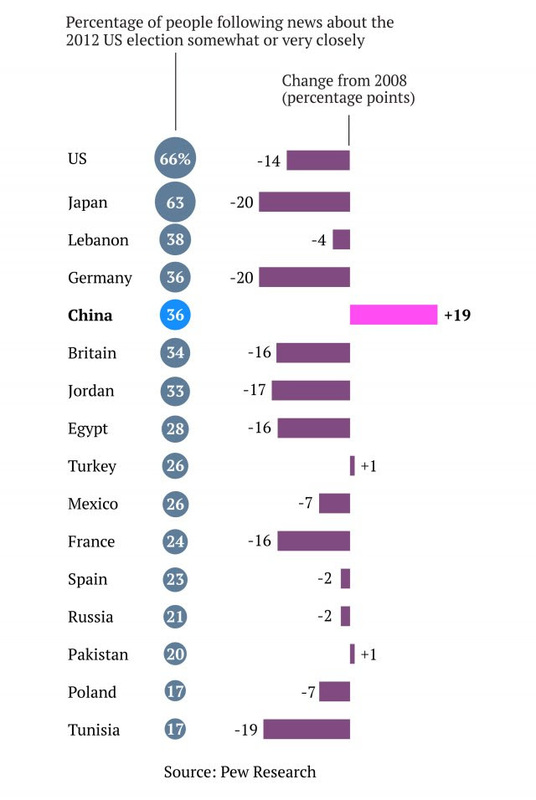 In a dramatic swing from 2008, only China is more interested in this election. Apparent global disinterest doesn't change the fact that Americans are paying close attention to this election, and with good reason. With the economy still teetering on the brink, how we vote this year will really matter. Be sure to make time to vote on November 6th. Until then, please read on in our special section about elections past and present. Waiting, waiting, waiting and waiting. We're all waiting...for the election to be over, to see what happens to the fiscal cliff, to see what happens in Spain, Greece and Europe, and then there's the economic slow down in Japan and China. Waiting and waiting to see how each of these economic influences plays out. Will a Romney win increase business confidence that regulation will start to abate, opening the door to a more growth-oriented industrial policy? Even if Romney gets elected, will the Democrats in Congress stonewall him as the Republicans have stonewalled Obama? Will an Obama win depress business confidence, which will depress economic activity, thus leading us into another recession? Would Obama turn to a growth-oriented industrial polity now that he no longer needs environmental supporters to get elected again? Waiting, waiting and waiting is not great for economic activity and business planning. But while we wait, capital continues to flow towards building out infrastructure for our new natural resource plays. And as evidenced by recent data, more people are buying houses with interest rates at historic lows. For those readers not in Houston, real estate is booming here. Construction cranes seem to be popping up everywhere, inner city home lots are being scrapped for new spec homes, townhouses and multi-use retail/residential complexes, which have become the development du jour. Hmmm...we've seen this rodeo before in Houston. It's certainly nice to have all this activity, but when cranes and out of state license plates start showing up everywhere, it's usually a sign of a peaking economy. The last unemployment report caused several people to get up on their soapboxes with election year manipulation conspiracy theories. The devil is always in the details, and Jack Welch should have given those details a closer look before coming across as a reactionary old geezer. Unemployment did go down measurably, but for those who cared to unpack the data, the cause was a large uptick in part-time employment. One can look at the statistic with optimism, projecting that growing worker demand will soon translate into more permanent employment. Or one can suggest that growing part-time jobs doesn't hold a candle to the full-time, well paying jobs we really need. The skeptics might ask, you call this an economic recovery? It has been four years since Hope and Change convinced many the good ole days could be easily recovered. With more homes being built and sold, it makes sense to see some job growth. But that market is mostly dependent on the Federal Reserve manipulating interest rates to keep them at historic lows. At least we know that job creation in the oil patch is more organic and economically stimulating. We've heard stories of being able to earn $20 an hour at McDonalds in North Dakota. There's nothing like a genuine gold rush for wealth accumulation, expanding economic activity, job creation, wage increases and more tax collections. All this leads to lower demands for government welfare. How novel. Our finance employment market seems little changed over the last few months. There's still the risk of European institutions packing up and going home, but a rise in super regional U.S. banks will likely fill in any gap in lending needs. But the finance world remains on edge and dependent on government central banks to keep the game going. It is our opinion that Glass-Steagall will eventually return, with a Keep It Simple Stupid regulatory policy, removing taxpayer responsibility for Wall Street's casino-like risk on earnings. A new Glass-Steagall would separate financial services into numerous entities and thus create jobs. Risk would dip, but compensation likely would as well. Everyone needs to get used to less income, but really, it's never income that drives happiness anyway. Initiative is the seed of success. Patience and persistence nurture its growth. Good effort harvests the bounty. Real average hourly earnings for all employees fell 3% percent from August to September, seasonally adjusted, the U.S. Bureau of Labor Statistics reported today. A 3% percent increase in average hourly earnings was more than offset by a 6% percent increase in the Consumer Price Index for All Urban Consumers. U.S. import prices advanced 1.1% for the second consecutive month in September after falling the previous four months. The increase in each of the past two months was led by rising fuel prices. The Producer Price Index for finished goods rose 1.1% in September, seasonally adjusted. Prices for finished goods advanced 1.7% in August and moved up 0.3% in July. At the earlier stages of processing, prices received by manufacturers of intermediate goods rose 1.5% in September, and the crude goods index advanced 2.8%. The 14th Amendment (1868) defined citizens as "all persons born or naturalized" in the U.S. and declared that no male citizen could be denied the right to vote. However, many states implemented literacy tests and poll taxes to prevent poor white and black males from voting. The 15th Amendment (1870) prevented any state from barring the right to vote based on "race, color or previous condition of servitude" (i.e. slavery). Still, many states continued to use poll taxes and literacy tests and made it difficult for many people to access polling stations to shut out voter blocks. The 19th Amendment (1920) granted women the right to vote. Initial female voter participation was quite low, as their new right was such a dramatic change that it took time for many women to get accustomed to voting. The 23rd Amendment (1961) granted voting rights for the first time to residents of Washington D.C., who had up to then never been permitted a vote in presidential elections. The 24th Amendment (1964) made it illegal to use any sort of tax to condition voting rights, officially eliminating the use of poll taxes. The 26th Amendment (1971) lowered the national voting age from 21 to 18. 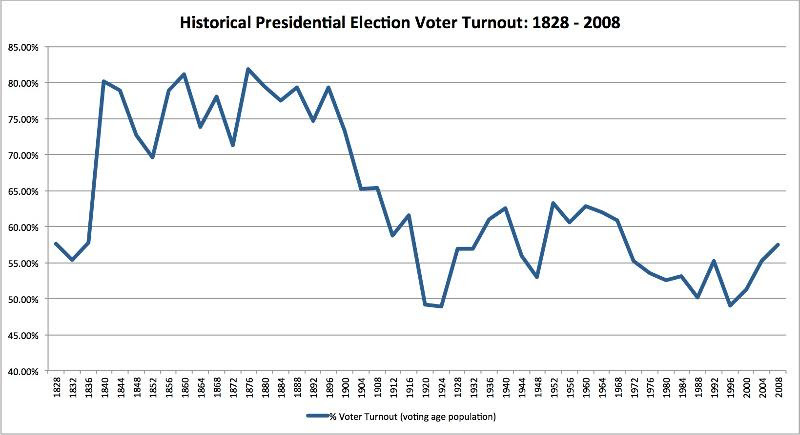 Note: There are no official records of voter participation prior to the 1828 election. 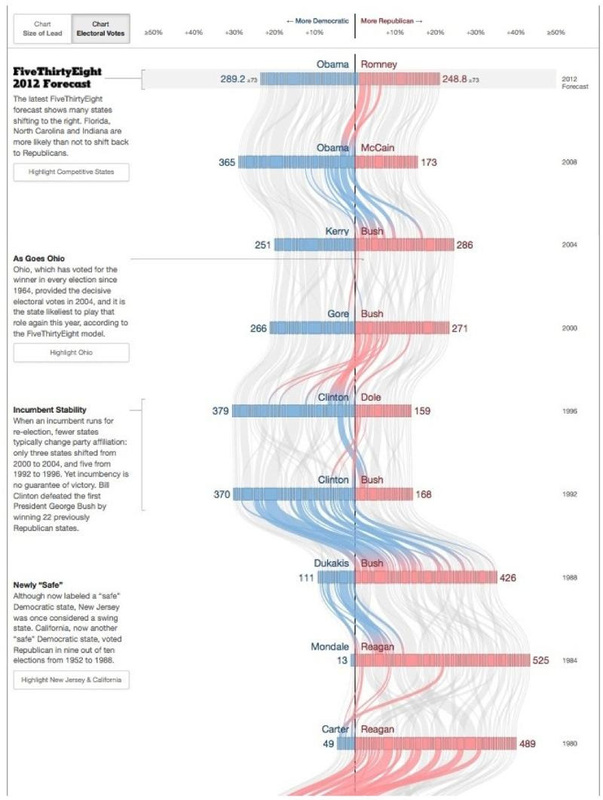 This fascinating interactive chart shows which way states have voted in every election since 1952. Click the link to see the full chart, which shows that there used to be many more "swing" sates out there than there are today. Prior to Bush-Gore in 2000, electoral numbers saw far more dramatic swings from one election to the next. Yet since 2000, we see electoral votes hovering closer to an even split, putting all that much more focus on fewer swing states. 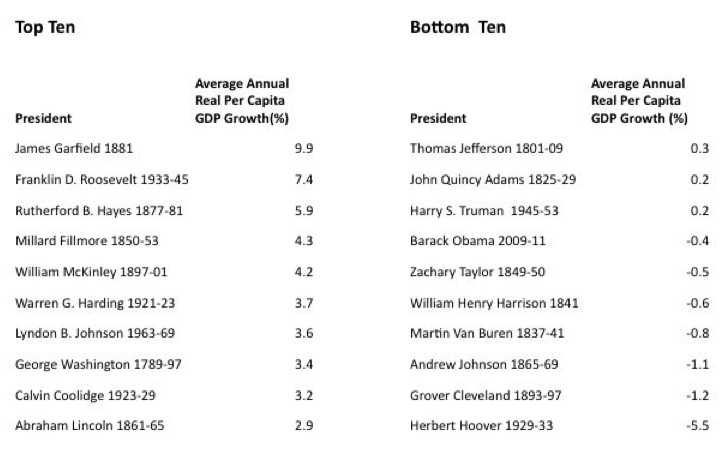 A snapshot of the 10 best presidents for GDP growth, and the 10 worst. Follow the link for a list of how all 44 presidents stack up. Our presidential debates today get so much media attention it's hard to imagine a time when they didn't exist. But debates are actually quite new. The 1960 Nixon-Kennedy debate was the first general presidential election debate, and then there were no presidential debates in 1964, 1968 and 1972. The series of presidential debates as we know them today did not start until 1976, when the incumbent, President Ford, made a infamous blunder about the Soviet Union, which helped push momentum in Jimmy Carter's favor. As we've all seen, tiny moments in debates can have a large impact, sometimes even turning the tide of an election. 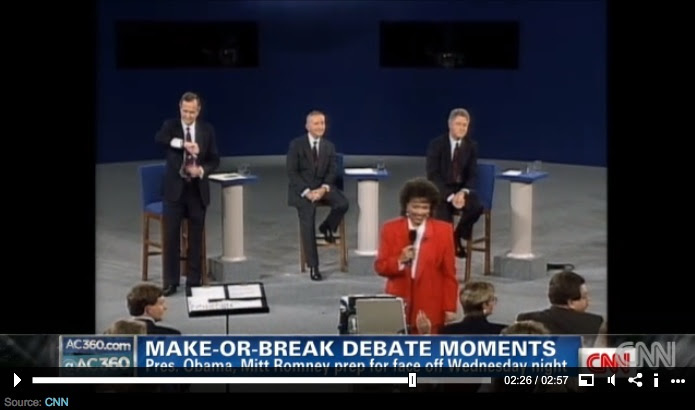 Watch the video for the most memorable and game-changing moments from the very first debate, between a telegenic Senator John F. Kennedy and sweating, uncomfortable Vice President Nixon. 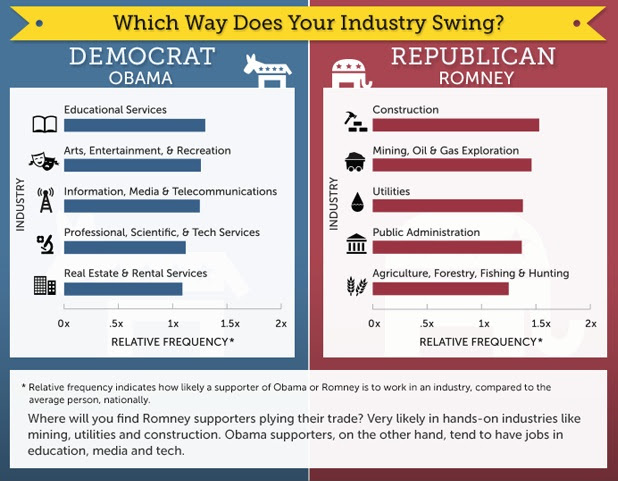 Does your industry or salary impact your vote? 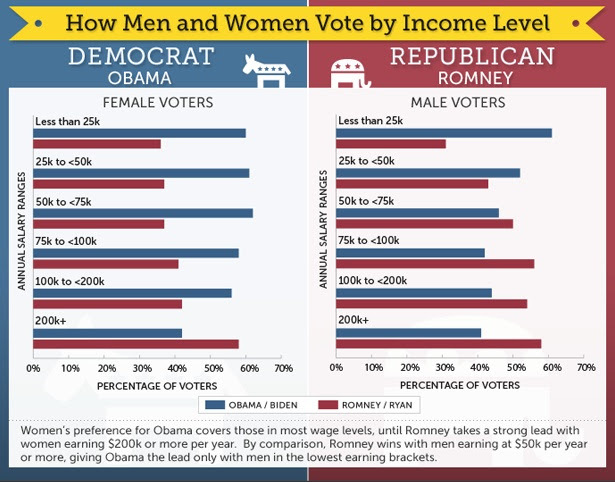 PayScale compiled survey data to see if there are any voting trends by job-related factors. Follow the link for more charts. From FDR through the 1960s, the democrats were the party of blue-collar workers and minorities, and the republicans had solid voter contingents with white-collar workers and small business owners. In the 1960s, Republicans began gaining support from working-class white voters, disrupting the balance as we'd known it for decades. In the 1980s, white college-educated men and women began turning more towards the democrat party, and have by and large remained there since. 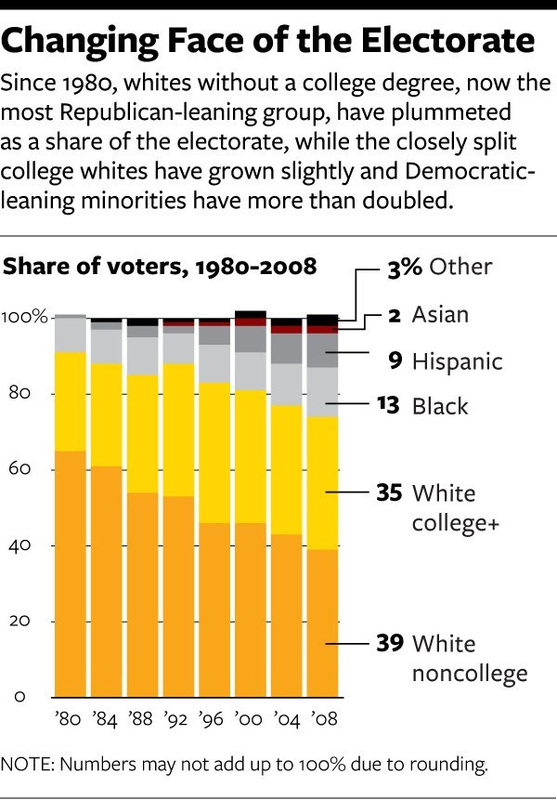 These trends are particularly significant when measured against the changing face of the electorate, where the non-college-educated whites are shrinking as a share of voters, and minorities are gaining share. 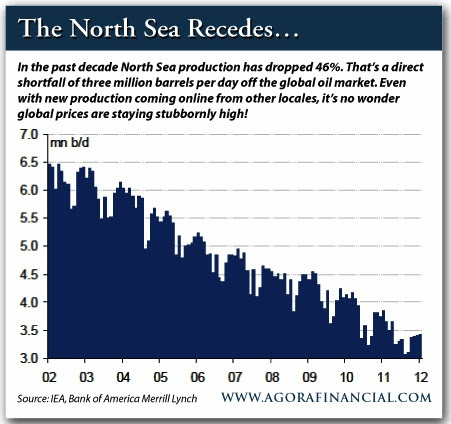 for the greatness is already there"
Two eye-popping predictions in this article: 1) North America will account for 75% of crude output growth in the next five years; 2) The U.S. is set to be the largest contributor to global oil growth. Crude oil output is declining in multiple typically prolific oil zones. Meanwhile, in 2011, the U.S. became a net exporter of petroleum - a trend that could stick for several years, while likely opening up our economy to a huge energy boom. This startling survey also revealed that many of these Americans with less than $500 in savings are not defined as poor. Some have houses, mortgages and 401(k)s, but no savings to speak of. Additional disturbing survey data showed that 54% of respondents don't have a savings plan in place, and 45% worry that they'll never be able to save. Just as we go through several development stages from birth to adulthood, leaders also go through development to reach leadership maturity. There are five of them, according to this author. He argues that successful leaders will take care to advance through all five stages to avoid stunting their growth. Amazon's Jeff Bezos believes the smartest people are those who aren't afraid to have a thought that contradicts an earlier thought. He argues this willingness shows a general desire to deepen understanding and remain open to ideas and information that challenge their way of thinking. This article lays out suggestions for hiring managers to move past first impressions, which are limited, when interviewing candidates. As an example, try to bring a little cynicism to an interview to preclude shifting to softball questions and going into sales mode. The author also recommends never leaving hiring decisions to any one person, but making it a team effort. At core, training employees is about teaching strategic skills, above traits, that will help them become more effective in their roles, and then creating metrics with which to regularly measure performance. Read on for tactics to apply this strategy to support your employees.